Voters who have relied on the network evening newscasts for information about the 2016 presidential candidates saw four times more airtime devoted to controversies involving presumptive GOP nominee Donald Trump than to the scandals surrounding his Democratic rival Hillary Clinton. Indeed, the only Clinton scandal to receive more than a minimal amount of attention from the networks during the primaries was the ongoing investigation of Clinton’s use of a private e-mail server and her mishandling of classified information while serving as Secretary of State. The networks paid little or no attention to a host of other Clinton controversies that likely would have been big news if they had been associated with her GOP opponent. 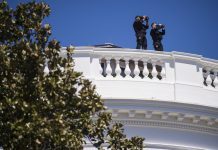 MRC analysts reviewed all 1,099 stories on the ABC, CBS and NBC evening newscasts which talked about the presidential campaign between January 1 through June 7, including weekends. This tally includes 950 full reports and interview segments; 66 short items read by the anchor; plus 83 stories on other topics that included some discussion of one or more of the candidates. The overall amount of campaign airtime is extraordinary: 2,137 minutes of coverage, or more than one-fourth (26.1%) of all evening news airtime during this period, excluding commercials and teases. Nearly half of that airtime (1,068 minutes) was spent talking about Donald Trump, the presumptive GOP nominee, compared to 583 minutes of coverage for Hillary Clinton. Clinton’s rival for the Democratic nomination, Vermont socialist Bernie Sanders, came in third, with 366 minutes of coverage, more than any of Trump’s GOP rivals. 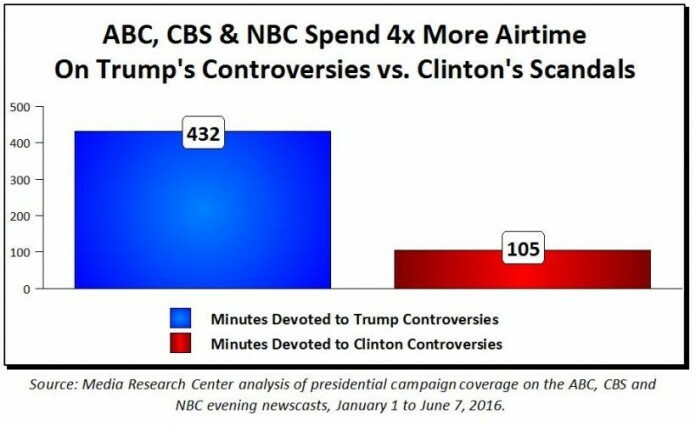 Compared to Clinton, a much higher percentage of Trump’s airtime (40 percent, or 432 minutes) was spent discussing the controversies surrounding the Republican’s candidacy. Only 18 percent of Clinton’s coverage (105 minutes) was spent discussing similar controversies, as network reporters paid scant attention to stories that would have garnered far more airtime had Trump been involved. Read the full report at NEWSBUSTERS.